This important analysis and review of US military might by distinguished Canadian geographer Professor Jules Dufour and CRG Research Associate was first published by Global Research in 2007. US military presence around the World has expanded dramatically in the course of the last five years. This study is largely based on data for the period 2001-2005. The Worldwide control of humanity’s economic, social and political activities is under the helm of US corporate and military power. Underlying this process are various schemes of direct and indirect military intervention. These US sponsored strategies ultimately consist in a process of global subordination. The 2000 Global Report published in 1980 had outlined « the State of the World » by focusing on so-called « level of threats » which might negatively influence or undermine US interests. Twenty years later, US strategists, in an attempt to justify their military interventions in different parts of the World, have conceptualized the greatest fraud in US history, namely « the Global War on Terrorism » (GWOT). The latter, using a fabricated pretext constitutes a global war against all those who oppose US hegemony. A modern form of slavery, instrumented through militarization and the « free market » has unfolded. 2) the taking over of all natural resources (primary resources and nonrenewable sources of energy). The latter constitute the cornerstone of US power through the activities of its multinational corporations. The US has established its control over 191 governments which are members of the United Nations. The conquest, occupation and/or otherwise supervision of these various regions of the World is supported by an integrated network of military bases and installations which covers the entire Planet (Continents, Oceans and Outer Space). All this pertains to the workings of an extensive Empire, the exact dimensions of which are not always easy to ascertain. Known and documented from information in the public domaine including Annual Reports of the US Congress, we have a fairly good understanding of the strucuture of US military expenditure, the network of US military bases and the shape of this US military-strategic configuration in different regions of the World. The objective of this article is to build a summary profile of the World network of military bases, which are under the jurisdiction and/or control of the US. The spatial distribution of these military bases will be examined together with an analysis of the multibillion dollar annual cost of their activities. In a second section of this article, Worldwide popular resistance movements directed against US military bases and their various projects will be outlined. In a further article we plan to analyze the military networks of other major nuclear superpowers including the United Kingdom, France and Russia. d) Communication and Spy Bases. The main sources of information on these military installations (e.g. C. Johnson, the NATO Watch Committee, the International Network for the Abolition of Foreign Military Bases) reveal that the US operates and/or controls between 700 and 800 military bases Worldwide. 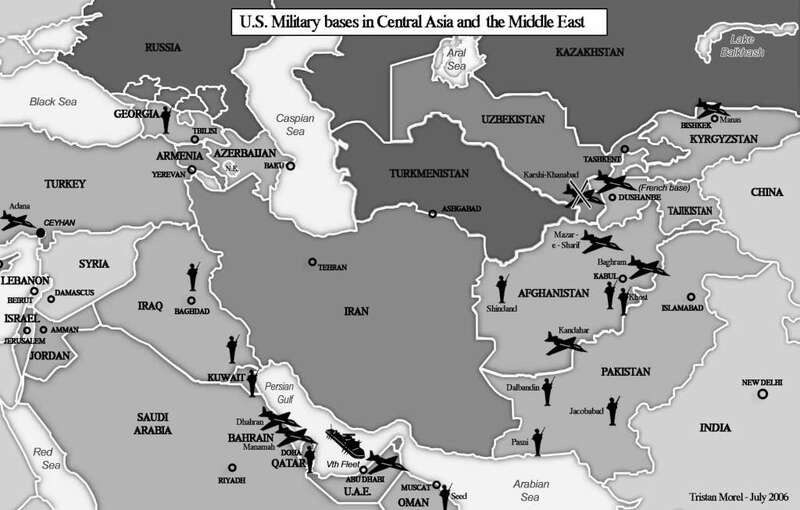 In this regard, Hugh d’Andrade and Bob Wing’s 2002 Map 1 entitled « U.S. Military Troops and Bases around the World, The Cost of ‘Permanent War' », confirms the presence of US military personnel in 156 countries. 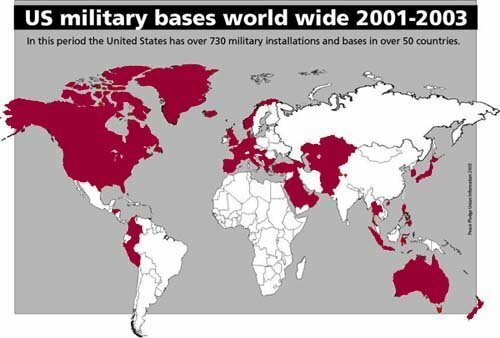 The US Military has bases in 63 countries. Brand new military bases have been built since September 11, 2001 in seven countries. In total, there are 255,065 US military personnel deployed Worldwide. 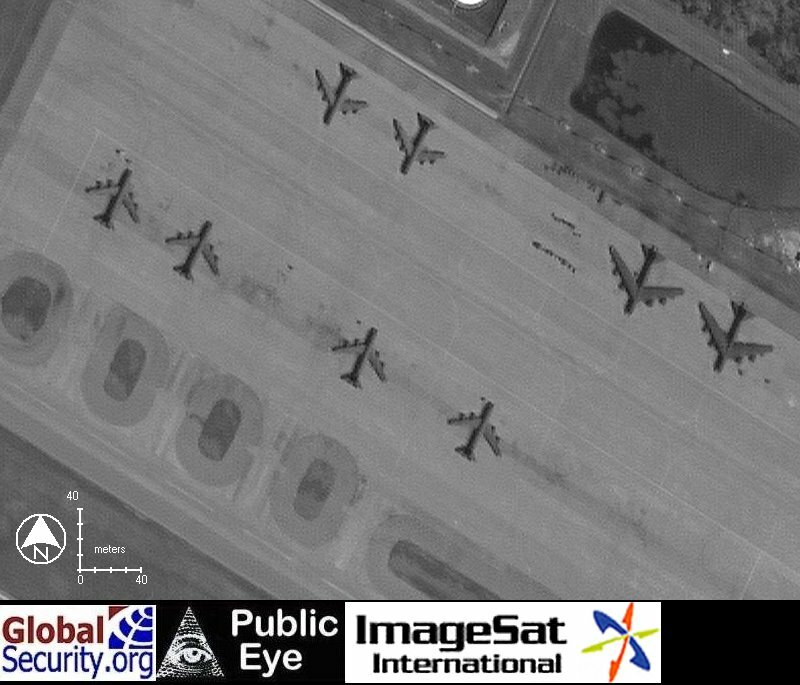 Based on a selective examination of military bases in North America, Latin America, Western Europe, the Middle East, Central Asia, Indonesia, the Philippines and Japan, several of these military bases are being used for intelligence purposes. New selected sites are Spy Bases and Satellite-related Spy Bases. These military bases and installations of various kinds are distributed according to a Command structure divided up into five spatial units and four unified Combatant Commands (Map 4). Each unit is under the Command of a General. The Earth surface is being conceived as a wide battlefield which can be patrolled or steadfastly supervised from the Bases. Territories under a Command are: the Northern Command (NORTHCOM) (Peterson Air Force Base, Colorado), the Pacific Command (Honolulu, Hawaii), the Southern Command (Miami, Florida – Map 5), The Central Command (CENTCOM) (MacDill Air Force Base, Florida), the European Command (Stuttgart-Vaihingen, Germany), the Joint Forces Command (Norfolk, Virginia), the Special Operations Command (MacDill Air Force Base, Florida), the Transportation Command (Scott Air Force Base, Illinois) and the Strategic Command (STRATCOM) (Offutt Air Force Base, Nebraska). Istres and Avord in France. There are 6000 military bases and/ or military warehouses located in the U.S. (See Wikipedia, February 2007). Total Military Personnel is of the order of 1,4 million of which 1,168,195 are in the U.S and US overseas territories. In Europe, there are 116,000 US military personnel including 75,603 who are stationed in Germany. In Central Asia about 1,000 are stationed at the Ganci (Manas) Air Base in Kyrgyzstan and 38 are located at Kritsanisi, in Georgia, with a mission to train Georgian soldiers. In the Middle East (excludng the Iraq war theater) there are 6,000 US military personnel, 3,432 of whom are in Qatar and 1,496 in Bahrain. In the Western Hemisphere, excluding the U.S. and US territories, there are 700 military personnel in Guantanamo, 413 in Honduras and 147 in Canada. 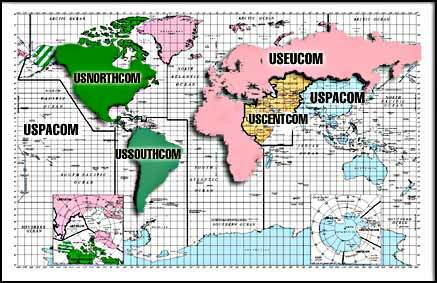 Map 3 provides information regarding military personnel on duty, based on a regional categorization (broad regions of the world). The total number of military personnel at home in the U.S. and/or in US Territories is 1,139,034. There are 1,825 in Europe 114, 660, 682 in Subsaharian Africa, 4, 274 in the Middle East and Southern Asia, 143 in the Ex-USSR, and 89,846 in the Pacific. 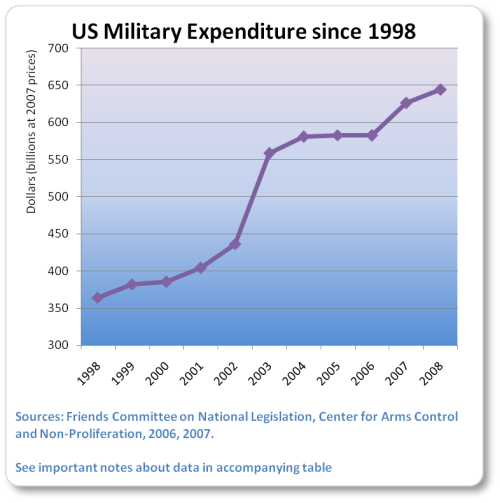 US defense spending (excluding the costs of the Iraq war) have increased from 404 in 2001 to 626 billion dollars in 2007 according to data from the Washington based Center for Arms Control and Non-Proliferation. US defense spending is expected to reach 640 billion dollars in 2008. (Figure 1 and http://www.armscontrolcenter.org/archives/002244.php ). These 2006 expenses correspond to 3.7% of the US GDP and $935.64 per capita (http://en.wikipedia.org/wiki/Military_of-the_United_States). According to Fig 1, the 396 billion dollars military budget proposed in 2003 has in fact reached 417.4 billion dollars, a 73% increase compared to 2000 (289 billion dollars). This outlay for 2003 was more than half of the total of the US discretionary budget. Since 2003, these military expenditures have to be added to those of the Iraq war and occupation The latter reached in March 2007, according to the National Priorities Project, a cumulative total of 413 billion dollars. Estimates of the Defense Department budget needs, made public in 2006 in the DoD Green Book for FY 2007 are of the order of 440 billion dollars. Military and other staff required numbered 1,332,300. But those figures do not include the money required for the « Global World on Terrorism » (GWOT). In other words, these figures largely pertain to the regular Defense budget. In the wake of 9/11, Washington initiated its « Global War on Terrorism » (GWOT), first in Afghanistan and then in Iraq. Other countries, which were not faithfully obeying Washington’s directives including Iran, North Korea, Syria and Venezuela have been earmarked for possible US military intervention. Washington keeps a close eye on countries opposed to US corporate control over their resources. Washington also targets countries where there are popular resistance movements directed against US interests, particularly in South America. In this context, President Bush made a quick tour to Brazil, Uruguay, Colombia, Guatemala and Mexico «to promote democracy and trade» but also with a view to ultimately curbing and restraining popular dissent to the US interests in the region. . The US. are at War in Afghanistan and Iraq. They pursue these military operations until they reach their objective which they call « VICTORY ». According to Wikipedia (http://en.wikipedia.org/wiki/Deployment_of-the_U.S.-Military), American troops fighting in these countries number 190,000. The « Enduring Freedom » Operation in Iraq alone has almost 200,000 military personnel, including 26,000 from other countries participating to the US sponsored « Mission ». About 20,000 more could join other contingents in the next few months. In Afghanistan, a total of 25,000 soldiers participate to the operation (Map 6 and Map 7). US Military Bases in foreign countries, are mainly located in Western Europe: 26 of them are in Germany, 8, in Great Britain, and 8 in Italy. There are nine military installations in Japan (Wikepedia). In the last few years, in the context of the GWOT, the US haa built 14 new bases in and around the Persian Gulf. It is also involved in construction and/or or reinforcement of 20 bases (106 structured units as a whole) in Iraq, with costs of the order of 1.1 billion dollars in that country alone (Varea, 2007) and the use of about ten bases in Central Asia. The US has also undertaken continued negotiations with several countries to install, buy, enlarge or rent an addional number of military bases. The latter pertain inter alia to installations in Morocco, Algeria, Mali, Ghana, Brazil and Australia (See Nicholson, B., 2007), Poland, Czech Republic (Traynor, I., 2007), Ouzbekistan, Tadjikistan, Kirghizstan, Italy (Jucca, L., 2007) and France. Washington has signed an agreement to build a military base in Djibouti (Manfredi, E., 2007). All these initiatives are a part of an overall plan to install a series of military bases geographically located in a West-East corridor extending from Colombia in South America, to North Africa, the Near East, Central Asia and as far as the Philippines (Johnson, C., 2004). The US bases in South American are related to the control and access to the extensive natural biological , mineral and water resources resources of the Amazon Basin. (Delgado Jara, D., 2006 and Maps 9 and 10). The network of US military bases is strategic, located in prcximity of traditional strategic resources including nonrenewable sources of energy. This military presence has brought about political opposition and resistance from progressive movements and antiwar activists. Demonstrations directed against US military presence has developed in Spain, Ecuador, Italy, Paraguay, Uzbekistan, Bulgaria and in many other countries. Moreover, other long-termer resistance movements directed against US military presence have continued in South Korea, Puerto Rico, Guam, the Philippines, Cuba, Europe, Japan and other locations. The Worldwide resistance to US foreign military bases has grown during the last few years. We are dealing with an International Network for the Abolition of US Military Bases. Such networks’ objective is to broadly pursue disarmament, demilitarization processes Worldwide as well as dismantle US military bases in foreign countries. The NO BASES Network organizes educational campaigns to sensitize public opinion. It also works to rehabilitate abandoned military sites, as in the case of Western Europe. These campaigns, until 2004, had a local and national impact. « At the time of an International anti-war meeting held in Jakarta in May 2003, a few weeks after the start of the Iraq invasion, a global anti-military Bases campaign has been proposed as an action to priorize among global anti-war, justice and solidarity movements» (http://www.no-bases.org/index.php?mod=network&bloque=1&idioma=en). Since then, the campaign has acquired greater recognition. E-mail lists have been compiled ([email protected] and [email protected] ) that permit the diffusion of the movement members experiences and information and discussion exchanges. That list now groups 300 people and organizations from 48 countries. A Web site permits also to adequately inform all Network members. Many rubrics provide highly valuable information on ongoing activities around the World. In addition, the Network is more and more active and participates in different activities. At the World Social Forums it organized various conferences and colloquia. It was present at the European Social Forum held in Paris in 2003 and in London in 2004 as well as at the the America’s Social Forum in Ecuador in 2004, and at the Mediterranean Social Forum in Spain in 2005. One of the major gatherings, which was held in Mumbai, India, in 2004, was within the framework of the World Social Forum. More than 125 participants from 34 countries defined the foundations of a coordinated global campaign. Action priorities were identified, such as the determination of a global day of action aiming at underscoring major issues stemming from the existence of US military bases. The Network also held four discussion sessions at the Porto Alegre Social Forum in 2005. One of those pertained to the financing of the Network’s activities. It is important to recall that the Network belongs to the Global Peace Movement. Justice and Peace organizations have become more sensitized on what was at stake regarding US military bases. – Establish global action plans to fight and reinforce the resistance of local people and ensure that these actions are being coordinated at the international level. This article has focussed on the Worldwide development of US military power. The US tends to view the Earth surface as a vast territory to conquer, occupy and exploit. The fact that the US Military splits the World up into geographic command units vividly illustrates this underlying geopolitical reality. Humanity is being controlled and enslaved by this Network of US military bases. . The ongoing re-deployment of US troops and military bases has to be analyzed in a thorough manner if we wish to understand the nature of US interventionism in different regions of the World. This militarization process is characterized by armed aggression and warfare, as well as interventions called « cooperation agreements ». The latter reaffirmed America’s economic design design in the areas of trade and investment practices. Economic development is ensured through the miniaturization or the control of governments and organizations. Vast resources are thereby expended and wasted in order to allow such control to be effective, particularly in regions which have a strategic potential in terms of wealth and resources and which are being used to consolidate the Empire’s structures and functions. The setting up of the International Network for the Abolition of Foreign Military Bases turns out to be an extraordinary means to oppose the miniaturization process of the Planet. Such Network is indispensable and its growth depends on a commitment of all the People of the World. It will be extremely difficult to mobilize them, but the ties built up by the Network among its constituent resistance movements are a positive element, which is ultmately conducive to more cohesive and coordinated battle at the World level. The Final Declaration of the Second International Conference against Foreign Military Bases which was held in Havana in November 2005 and was endorsed by delegates from 22 countries identifies most of the major issues, which confront mankind. This Declaration constitutes a major peace initative. It establishes international solidarity in the process of disarmament. .
COMITÉ DE SURVEILLANCE OTAN. 2005. Las bases militares : un aspecto de la estrategia global de la OTAN. Intervencion del Comité Surveillance Otan en la Conferencia Internacional realizada en La Habana 7-11.11.2005. 9 pages. DELGADO JARA, Diego. 2006. Bases de Manta, Plan Colombia y dominio de la Amazonia. Militarizacion de la Hegemonia de EE. UU. En América latina. 17 pages. EQUIPO DE COMUNICACIÓN CONFERENCIA NO BASES. 2007. La gente del mundo no quiere bases militares extranjeras. Ghana to host US Military Base? February 26, 2006. JOHNSON, C., America’s Empire of Bases. January 2004. JOHNSON, C. America’s Empire of Bases. Janvier 2004 . JOHNSON, C. 2005. The Sorrows of Empire. Militarism, Secrecy, and the End of the Republic. Henry Holt, April 2005, Paperback. 389 pages. JUCCA, L., 2007. Italians protest over U.S. base expansion. Sat Feb 17, 2007. MANFREDI, E. 2007. Djibouti : Hôtel Corne d’Afrique, grande base américaine. Le GRAND SOIR.info. Édition du 23 mars 2007. NEW INTERNATIONALIST. 2004. The Bases of Resistance, December 2004, Issue 374. NICHOLSON, B. 2007. Secret New Us Spy base to Get Green Light. February 15, 2 007. TRAYNOR, I. 2007. US EXPANDS, Builds New Military Bases in Europe. The Guardian, anuary 22, 2007. TSAVDARIDIS, I., 2005. Military Bases around the world and in Europe – the role of the USA and NATO. Novembre 2005. Stop USA / STOP United States of Agression. VAREA, C., Las bases Militares de EEUU en Iraq. 4 mai 2006. Nodo50. Bases y Ejercicios Militares de EE.UU. El Comando Sur. Campana. Un mundo sin bases militares . Asemblea de Organizaciones y Movimientos contra la guerra, la OTAN y el Neoliberalismo (Madrid), Nodo50. Challenges to the US Empire, http://www.globalpolicy.org/empire/challenges/challengesindex.htm. Washington veut installer une base militaire en Algérie. Le Quotidien d’Oran, 20 juillet 2003.
International Conference against Foreign Military Bases. Final Declaration. Interview with Chalmers Johnson, Part 1. An Empire of More Than 725 Military Bases. Liste des bases militaires américaines dans le monde. Jules Dufour is President of the United Nations Association of Canada (UNA-C) – Saguenay-Lac-Saint-Jean branch and Research Associate at the Centre for Research on Globalization (CRG). He is Emeritus Professor of Geography at the University of Quebec, Chicoutimi. In 2007, Professor Jules Dufour became Chevalier de l’Ordre national du Québec, a distinction conferred by the Quebec government, for his contributions to World peace and human rights, his numerous scholarly writings and the work he accomplished in the context of national and international commissions on issues pertaining to regional development, human rights and the protection of the environment. Article in French, 10 avril 2007.